The worst part of altitude sickness is the incessant headache. The shortness of breath is annoying but tolerable, one just has to hike slower. And so it is that I find myself high in the Andes Mountains of southern Peru. By convention the rules of acclimation are to only ascend 4000 feet every two days. The hastily arranged nature of my trip to Peru did not really afford me the luxury of slow acclimation, when I landed in Lima at midnight I took another flight directly to Cuzco. I found out I had an extra week of vacation on Friday morning, bought my last minute ticket Friday afternoon, and was hiking in Peru by Saturday. I have tacked on a week in Peru to my already planned trip to Jamaica and Cuba this month. In 1911 the lost Incan city was hidden by a thick blanket of vegetation and local folklore speculated that there once existed a sacred city nearby. An American archeologist named Hiram Bingham had been looking for the lost city of Vilvabamba when he decided to investigate and Machu Picchu was reborn. 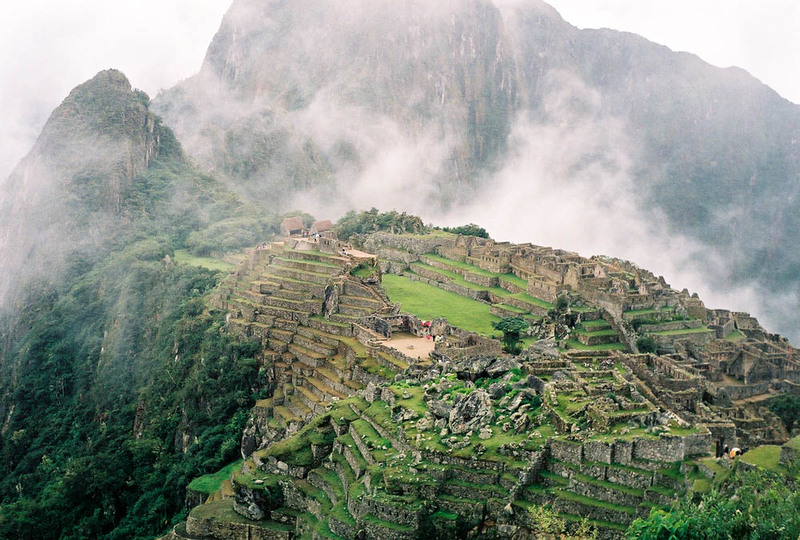 Machu Picchu is a sprawling temple that literally sits above the clouds atop a steep peak. The other nearby peaks disappear in and out of the clouds and occasionally through holes in the clouds the valley between is visible far below. The vast labyrinth of stone temples and ancient corridors is seen in its entirety by climbing one of the other nearby peaks. My first reaction upon ascending the peak was one of mild disappointment. Visibility was 10 feet as the voracious clouds had almost wholly engulfed the ruins. Fortunately, the cloud cover later dropped lower and the view was phenomenal.phenomenal to such an extent that no measure of lyrical pyrotechnics could hope to approximate its stoic majesty. Occasionally random gales of cold wind would propel ethereal wisps of gossamer clouds sweeping right in front of my face. The intermittent drizzle added to the rich milieu of surreality. Staring down from the heavens as it were, a heavy feeling best described as intense, unavoidable, and ecstatic took hold of me, a sensation I have seldom felt. I lingered several hours awestruck at the imposing view. Later went for a trek on the perilous Inca trail, unfortunately time didnt permit traipsing the entire 4 day trek. The muddy trail carves through the forest bounded by sheer cliffs, rivers, and thick vegetation. 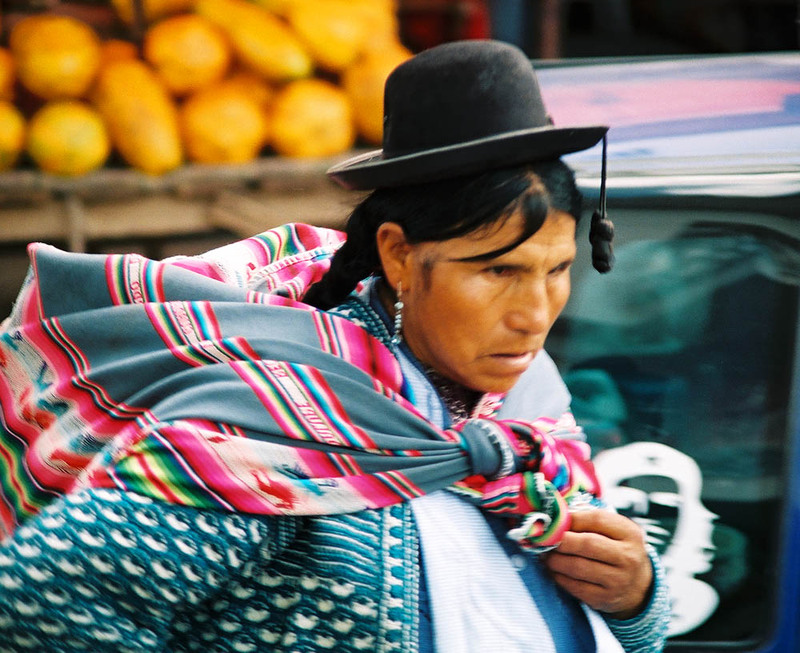 Brightly colored shawls and fantastically odd hats drew my stare as I ambled my way through the central market of Cuzco. To say that I appeared conspicuously out of place would be an understatement of the most egregious nature. The indigenous Peruvian Indian women sit in front of huge barrels of cocaine leaves and fresh fruit shouting at market goers in exotic Indian tongue. All manner of meat hang in the dank market stalls from skinned pork to guinea pigs ( a local delicacy I am told). Wild dogs crawl from stall to stall scouring the wet earth for scraps of sustenance. Cuzco boasts a massive cathedral constructed 3 centuries ago. A short trip outside Cuzco lie lesser pre-Columbian ruins with long difficult to pronounce names like Ollantyayambo and Sacsayhuaman. I have made my way to Puno mainly as a base for my trip on lake Titicaca. The air here is even thinner than Cuzco. Puno stands at 12,562 feet and just walking around can at times be a task, by now I have consumed ibuprofin like tic-tacs and my headache is somewhat at bay. The town of Puno itself is probably worth the trip. Narrow alleyways meander though the city with no apparent pattern but all seem to coalesce near the quaint town square. On to the lake..The boat was old and rickety and as it set off I could not help but chuckle. Recollections of elementary school come to mind and a teacher who endeavored to instill in her pupils a sense of history and familiarity with the rich natural wonders of the Americas, lake Titicaca is the world highest lake and one of the biggest in the world. She said Titi-Caca, I remember cracking up with the rest of the class. I dont think I ever ventured to imagine that my capricious method of travel would one day bring me to this most peculiar lake, but now that I am here the name Titicaca still sounds funny. I let off a sophomoric laugh as I remarked to the boat driver lago Titicaca es muy grande. The boat set off early in the morning and later arrived at one of the 40 or so artificial floating islands. A sight to behold. 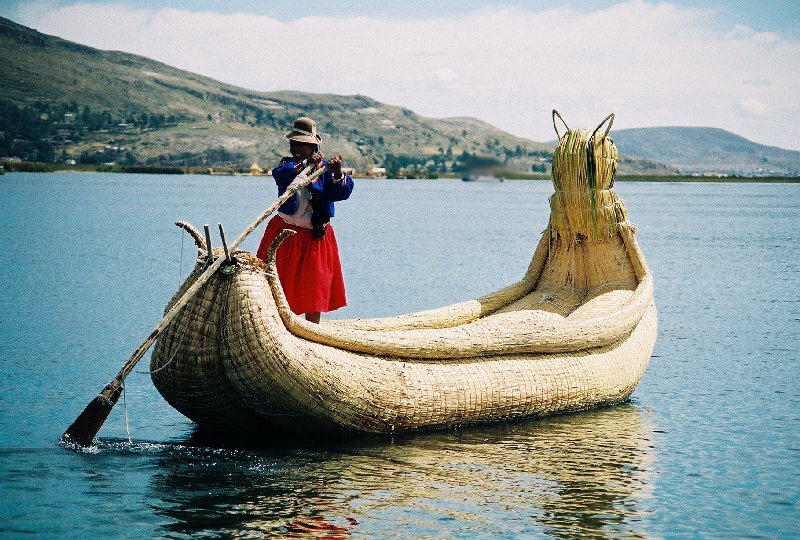 The Uros Indians started this curious mode of habitation 700 years ago. Most of the islands are the size of half a football field and are entirely artificial, yet people have lived here for hundreds of years. The islands are built upon layer upon layer of floating reeds. They are in a constant state of rebuilding as the bottom of the reeds rot off into the water six months after they reach the water. And so in this manner layer after layer is laid down and eventually is rotted away. Walking around is very disorienting as the floor has a bouncy quality much like a waterbed. Here local Indians lead their lives and are proud of their exotic dress. Huge boats fashioned from the same reeds are navigated by tireless locals from island to island.